Battlefield Service Center is a family-owned and operated business founded in 1973 which provides complete auto repair, light truck repair, and towing services to Manassas, Prince William County, and Northern Virginia. Battlefield Service Center is a family-owned and operated business serving Manassas, Prince William County, and Northern Virginia. James and Suzanne Dowell founded Battlefield Corporation (trading as Battlefield Service Center) in June of 1973. Through the years, Battlefield has thrived on personalized service, which means getting to know their customers’ families, vehicles, and driving habits. They are service oriented and believe in regular preventative maintenance to find any possible problems before they become big and costly problems. Battlefield Service Center is a complete automotive and light truck repair shop. They recommend genuine manufacturer parts for your repairs, and only use top of the line OEM replacement parts and products such as Interstate batteries, Castrol, Mobil One, and Rotella HD Diesel Premium Engine oils. Battlefield uses top of the line WIX Filters for your car’s air, oil, cabin, fuel, and transmission needs, as well as top quality tires such as Michelin, Goodyear, BF Goodrich, Cooper, Sumitomo, and many others. Battlefield believes in working for and doing business within their local community to support each other. Washingtonian Magazine has given Battlefield Service Center the "Highest Quality Rating" four years in a row. Battlefield Service Center in Manassas is approved and licensed by the Commonwealth of Virginia and the DCJS to do towing and emergency services for the Prince William County Police Department, Prince William County Sheriff Department, Virginia State Police, Virginia Department of Transportation, and the City of Manassas Police Department. Our employees are the backbone of Battlefield Service Center’s personal and caring service — including our manager Rick Tharp, who joined Battlefield Service Center in 1975. Because we offer an Emergency Towing Service 24/7, we'll answer the phone any time you call. Most of the time Jim will be the one answering the telephone. You won't get a recording unless all the lines are busy—you'll speak directly to one of our employees who will do their best to help you. So, why choose the name "Battlefield" Service Center? When Battlefield Service Center began as Battlefield Texaco, it was located at the National Battlefield Park on Sudley Road in Manassas, Virginia. Mel Johnson, who opened Battlefield Texaco in June 13, 1973, asked Jim Dowell to be his manager of operations. Jim had been one of Mel Johnson’s students at Marshall High School and participated in the automotive shop program for three years prior. As partners, they built the business to include Battlefield Texaco, Battlefield Service Center, Battlefield Automotive, Battlefield Transport, and Battlefield Towing. By 1981, these companies all served western Prince William County and Northern Virginia, operating under a division of Battlefield Corporation. Mel retired in 1990, and then passed away in 1993. By then, Jim had already taken over with the support of his family and the employees. In 1992 the Texaco station was sold so they could concentrate on auto and truck repairs and towing. Battlefield Service Center has been a family owned and operated business since its founding and remains so today. Battlefield Service Center is active in many local organizations and also supports youth activities such as baseball, basketball, football, soccer, and other local athletic teams. Jim is the state Vice President of VATRO, having held the position of President for 10 years, and is currently President of the local Prince William Chapter. Jim is an agent for the Concerned Towers of Prince William County, has served on the Dispute Arbitration Board for Ford Motor Company while it was in operation, and is involved in several other functions and non-profit organizations. Battlefield Service Center has trained and well-qualified employees to handle all types of towing. We do light, medium, and some heavy duty towing, and specialize in difficult recovery work. We have light and medium styled crane tow trucks with wheel lifts, light duty 4x4 styled crane tow trucks with wheel lifts, as well as rollbacks to cover all of our customer’s daily needs. All of our trucks are inspected and approved by the Prince William County Police Department and the Commonwealth of Virginia. All of our drivers are licensed with the Department of Criminal Justice Service (DCJS) of the Commonwealth of Virginia. 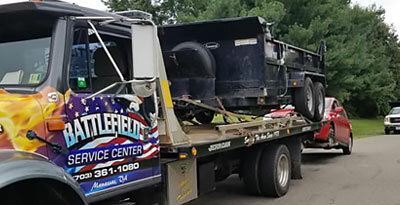 Battlefield Service Center is a member of both the Virginia Association of Towing and Recovery Operations (VATRO) and the Towing and Recovery Association of America (TRAA). All of our drivers are certified by both the Commonwealth of Virginia and by these towing associations. We are NOT a private property impounder towing company! We do not cruise home owners associations or businesses looking for illegally parked cars. 10% off LABOR on any job of $150 or more. For towing that is the result of abandonment, administrative impounds, evidence of a crime, an arrest, or other police requested tows, payment in full is required to release vehicle, checks not accepted.